Erik Jensen, former Special Representative of the UN Secretary General, file photo. Former Special Representative of the UN Secretary General Erik Jensen reiterated Thursday in New York the “inapplicability and non-feasibility of the UN settlement plan for the Moroccan Sahara issue. 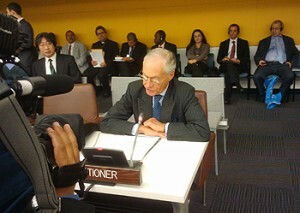 After recalling the major historical stages of this artificial conflict before the 193 UN member states during a meeting of the UN 4th Commission, Jensen said that the 40-year old census made by Spain, as well as the identification process of the settlement plan conducted by MINURSO have also failed and led to the same conclusion: the inapplicability of the UN peace plan. The former UN official, a connoisseur of the Sahara issue who has led MINURSO from 1993 to 1998, recalled Morocco’s autonomy initiative presented in 2007 as part of the Kingdom’s positive reaction to UN calls for a political solution. Besides the autonomy plan, Jensen added, the many reforms engaged in Morocco, such as the new constitution, the establishment of the Economic and social council and the reforms undertaken against corruption as well as the regionalization project are all points that strengthen Morocco’s autonomy plan.